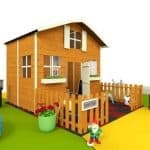 Would you love to have a playhouse for your children or grandchildren to enjoy, but don’t think you have a garden that’s big enough? This good looking Tulip Tower Playhouse could be just what you’re looking for. It offers two different levels for extra play opportunities, as the main playhouse itself is on a raised platform with a verandah and balcony, accessible via a ladder. Whilst supervision is necessary, as it is if children are playing in any raised area, you have the reassurance of knowing the building is made to the tough EN71 safety standard. The playhouse has three windows, one at the front and one at each side, and there’s also a round window on the door. This means that the interior has lots of light, and your youngsters will be able to look out at the garden and the world around them. We liked the fact that the windows feature styrene plastic glazing, as it means they’re very shatter resistant. 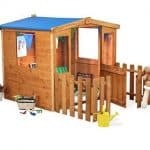 Weather protection is another plus with this playhouse thanks to the apex roof that quickly carries water away, and the tightly locking tongue and groove walls. We always like to see playhouses that look fun and exciting, and that’s just what we got here. Children aged three years and above are going to be excited when they see it, and they’ll be raring to race up their ladder into their new play centre. The playhouse itself combines the traditional look of a wooden shed with a fun and funky design, and there’s also a verandah with a balcony. We also like the fact that the verandah is partly covered by the overhanging roof, which keeps any rain or drizzle off the little ones. The elevated nature of this playhouse means that there’s also a shaded area underneath, and we can imagine this being used as a den, or a place to read or watch the clouds float by. 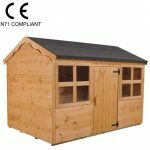 Despite all these features, and the potential for fun that they bring, this is quite a compact playhouse so won’t take up too much room in your garden. The ridge height at the pinnacle of the apex roof is 2.47m with an eaves height of 2.04m. The overall width is 1.84m and the overall depth is 1.98m, but these include the overhang. We were pleased to see that tongue and groove cladding had been used on the walls, as this is very effective at stopping rain water getting inside, thus creating a dry and warm environment. At 12mm thick it’s as thick as any playhouse that we’ve reviewed as well, and when combined with the standard 28 X 28mm frame it results in a structure that feels stable and solid. The floor is made of solid sheet material, as is the roof which is then covered with black mineral felt, but this time the thickness is 10mm. Whilst we would have liked to see it share the same thickness as the walls this is still strong enough for playhouse purposes. 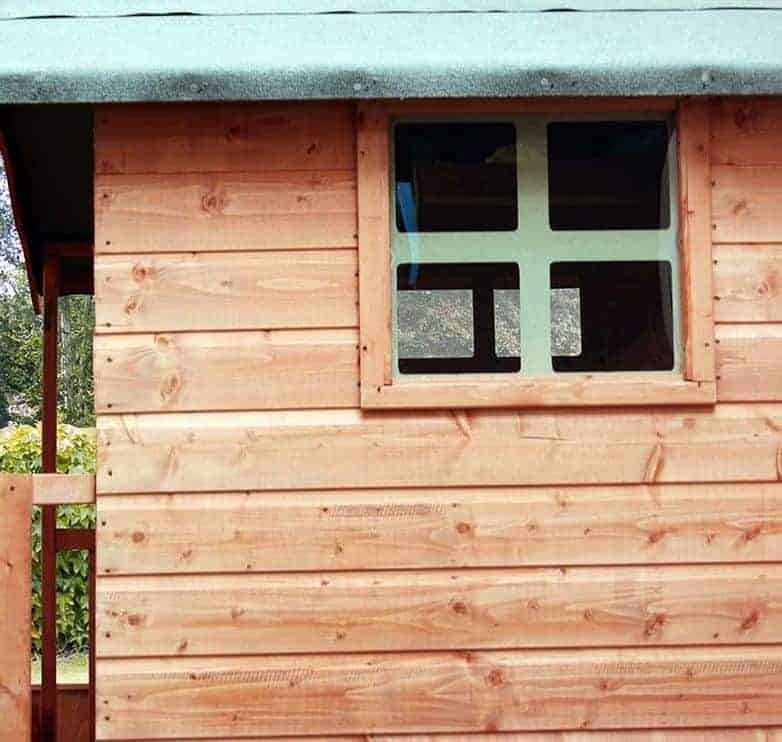 The manufacturer has used a dip treatment with wood preservative to give the timbers a basic initial protection against the elements, but as this isn’t one of the cheapest playhouses we’ve reviewed we would have preferred to see a longer lasting pressure treatment used. This means that there is a requirement for the customer to add their own treatments on a yearly basis, and it also means that only a one year warranty against rot is provided when the durable cladding potentially allows for a much longer warranty period. We feel that the door will be very inviting to children, thanks to its round window surrounded by wooden petals. It looks very attractive and appealing, and with a width of 0.59m and a height of 1.06m it’s easy for children to get in and out of. As well as the small round flower window on the door, there are also three full sized square windows. We were glad that styrene is used as the glazing, as while it still allows lots of light in, it won’t shatter if anything hits it. The use of styrene means that there’s one less thing for adults to worry about, and the EN71 safety mark shows that the building as a whole meets the stringent regulations for toy and play area safety. One added safety feature is the balcony at the end of the slatted verandah, although of course children playing on raised areas should be supervised at all times. 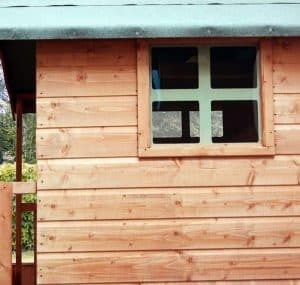 Whilst we like the traditional wooden look of the playhouse as it’s supplied, in its natural brown colouration, painting or staining it will help to stop it looking silver and tired over time. That’s why it was good to see a selection of woodstains offered. Alternatively, you may want to ask your children to help you pick a colour themselves and they could even help you paint it at ground level. Another useful extra is the optional installation service. Whilst its cost of £159.99 does add significantly to the overall price tag, we can imagine many customers taking advantage of it to save time whilst ensuring a perfect installation. 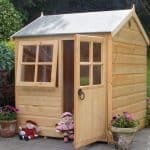 Windsor produce a lot of playhouses, and it really shows with the attention to quality that they’ve provided throughout this one. It was a little disappointing that only a basic dip treatment had been used, so the owner will have to treat it every year to give it added durability. Even though it has a relatively compact footprint, this still has a lot of space for two or three children to enjoy, thanks to its two levels. 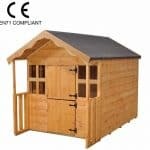 It was good to see that all fixtures and fittings have been included along with clear instructions, so you and a friend should be able to install this playhouse in around four to five hours. 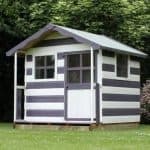 We have reviewed cheaper playhouses of a similar size, yet we still feel this provides reasonable value for money thanks to its quality and attractiveness. 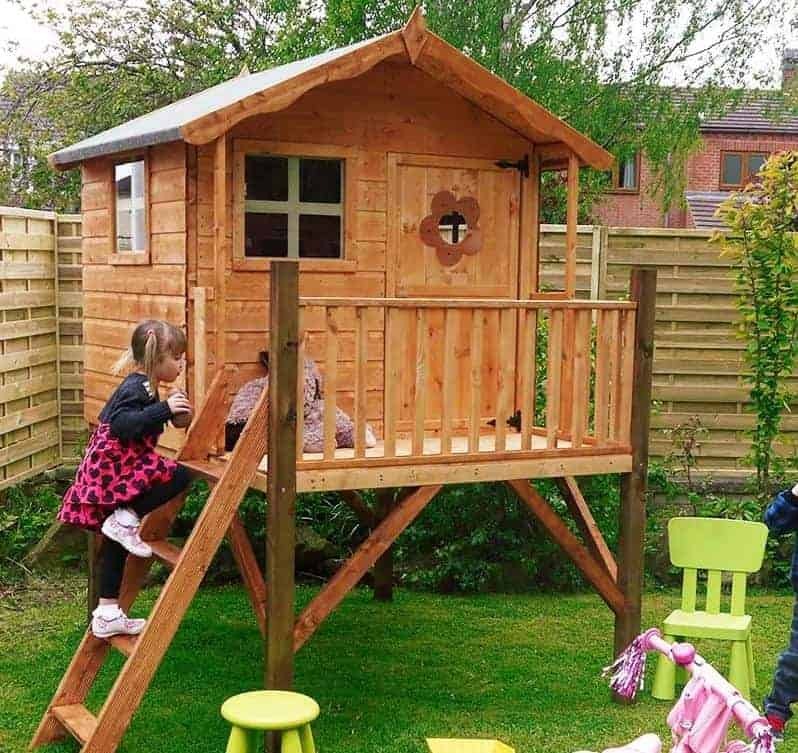 Final Thoughts: Thanks to this well designed and constructed tower playhouse, you don’t need a lot of space in your garden to provide your kids or grandkids with a lot of fun. There’s still more than enough room to fit games and toys in the playhouse itself, along with beanbags or seats. We think it looks attractive even in its basic, unpainted form so if painted in bright colours chosen by your little ones it can become vibrant and exciting. It will need regular treatment to keep it free of rot, but other than this it comes with everything you need for years of fun as your children or grandchildren grow up.